Housing a vast collection collection of elegant, luxurious fabrics from all the top designers, our dedicated make-up service is second to none. All our soft furnishings are manufactured in-house enabling us to work to very exacting standards and include curtains, blinds, cushions, pelmets, headboards, bed throws etc. Our expert curtain makers ensure a beautiful result whilst our professional curtain fitter can complete your project. 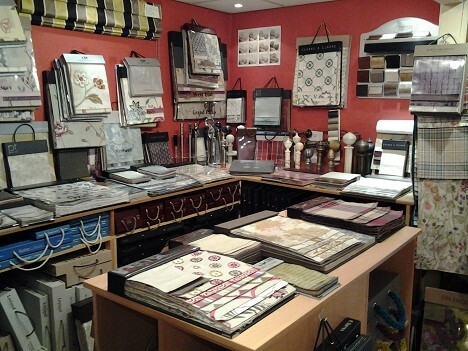 We also have a range of poles, finials, trimmings and wallpaper to complement your new curtains. We are happy to arrange a home visit to discuss requirements & measure your windows.